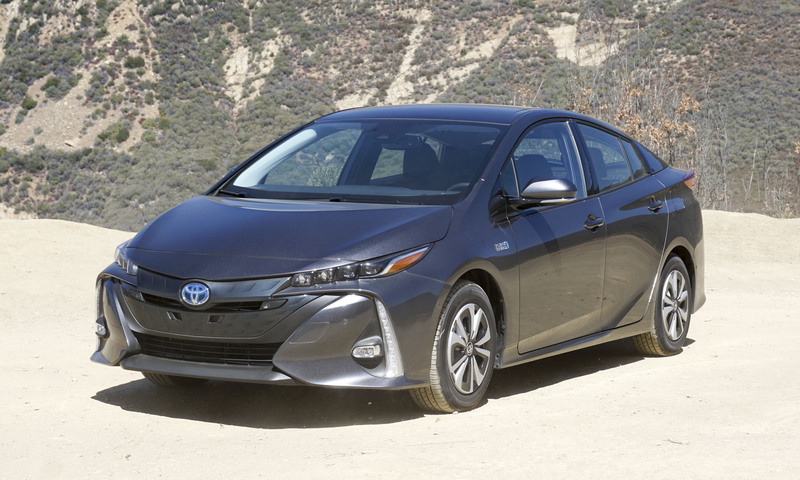 When we tested the all-new Toyota Prius late last year, we came away quite impressed. 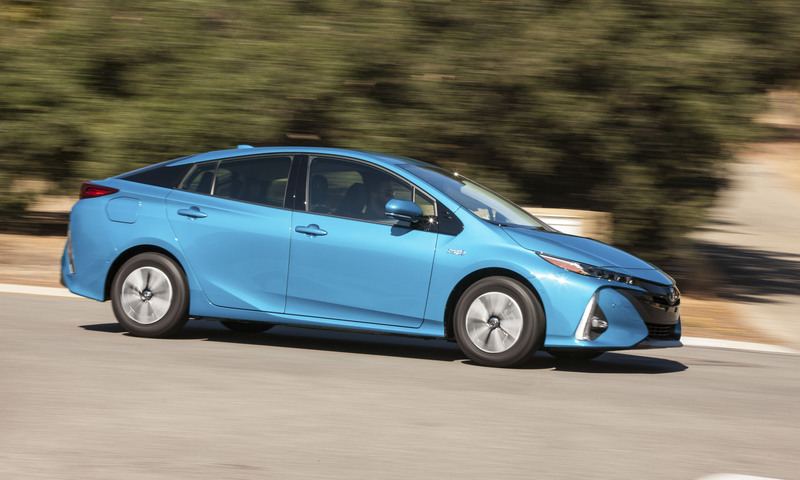 Driving dynamics, performance and fuel economy had all been improved, making the Prius a much more attractive fuel-efficient family-car option. For 2017 Toyota takes that package and updates the styling, adds new technology and — most importantly — adds the ability to operate as an electric-only vehicle for limited distances. 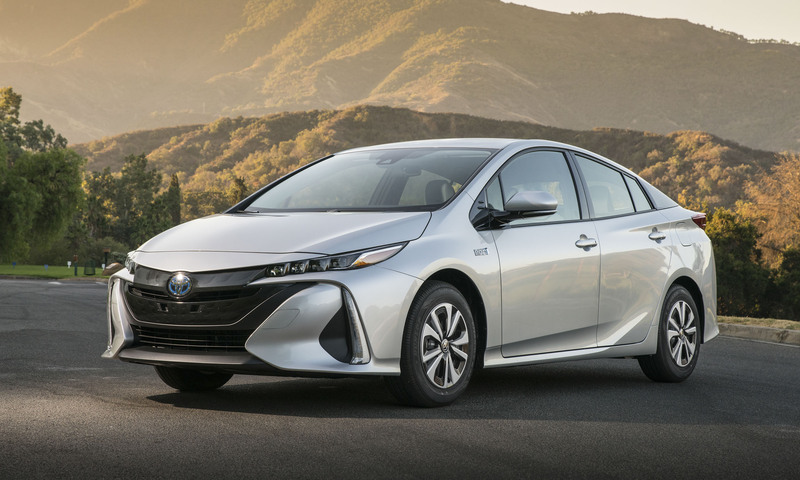 The Prius Prime is the company’s latest-generation plug-in hybrid with increased range and power over the previous version, as well as distinctive styling to help distinguish it from the standard Prius. 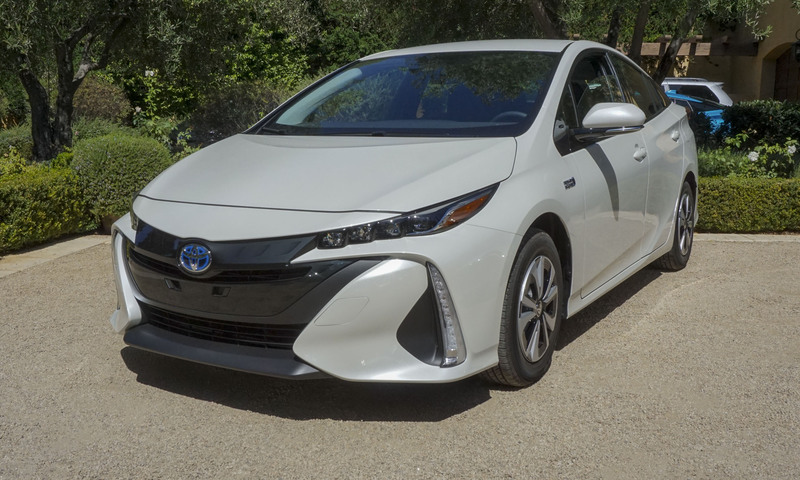 Toyota markets the Prius Prime as a separate vehicle line from the standard Prius, offering new features and equipment. 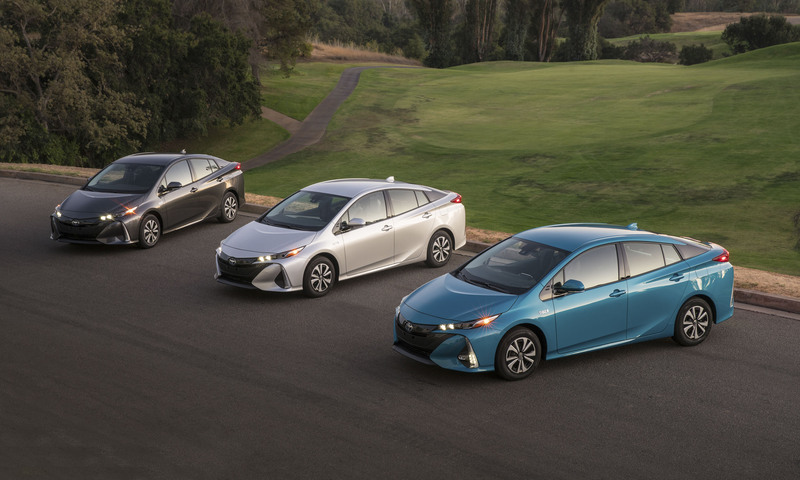 The Prius Prime is available in three trim levels: Plus, Premium and Advanced, with no factory options or packages — which simplifies customer choice. 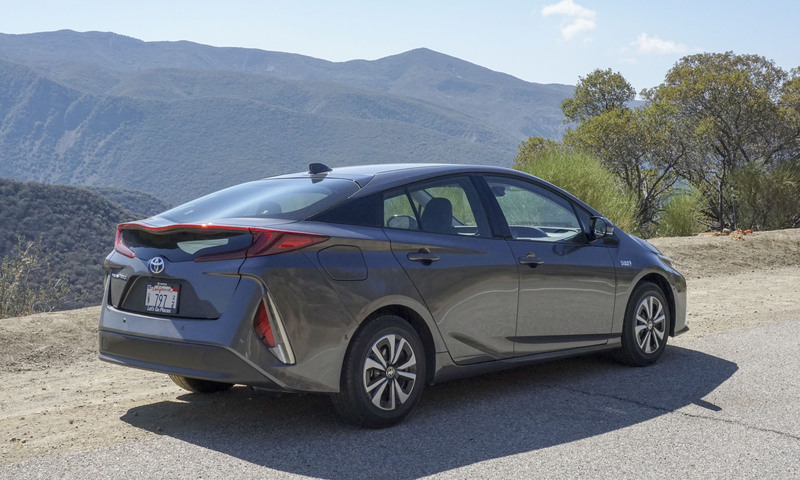 All Prius Primes will come standard with Toyota Safety Sense P, which includes a Pre-Collision System with Pedestrian Detection, Lane Departure Alert with Steering Assist, Automatic High Beams and Dynamic Radar Cruise Control. In addition, vehicle stability control, traction control and ABS with electronic brake-force distribution are also standard. The Plus is the entry-level version of the Prius Prime, and it has a starting price of $27,100. 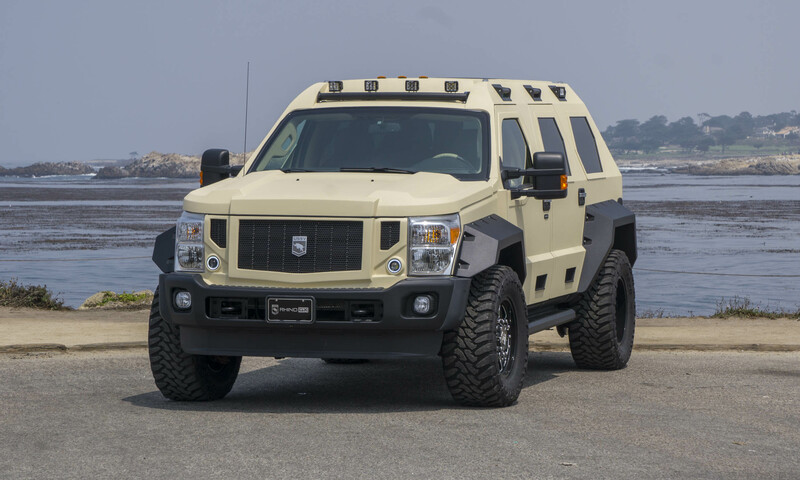 For comparative purposes, it’s about $3,000 more than a standard Prius. The Plus comes with an impressive list of standard features including heated front seats, a rearview camera, a 7-inch touchscreen display, GPS navigation, LED projector headlights, 15-inch 5-spoke alloy wheels and the Entune premium audio system with HD radio, Bluetooth streaming and six speakers. For an additional $1,700, buyers can upgrade to the Premium version of Prius Prime. Additions over the Plus include wireless phone charging, upgraded seat materials and a 11.6-inch high-resolution vertical display screen controllable with touch or swipe — much like a tablet or smartphone. The Premium also features Siri Eyes Free, the Entune App Suite, HD Radio predictive traffic and Doppler weather overlay. 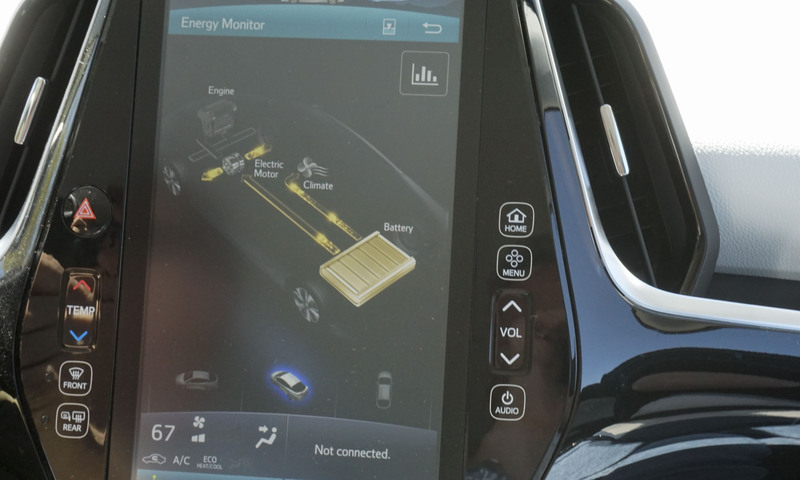 Also included are three months of SiriusXM Satellite Radio as well as a charging station map to help locate the closest power source. 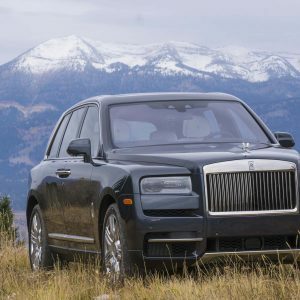 Priced at $33,100, the top-level Advanced trim is visibly different from the other two versions, most notably by the standard LED fog lights and accent lights. 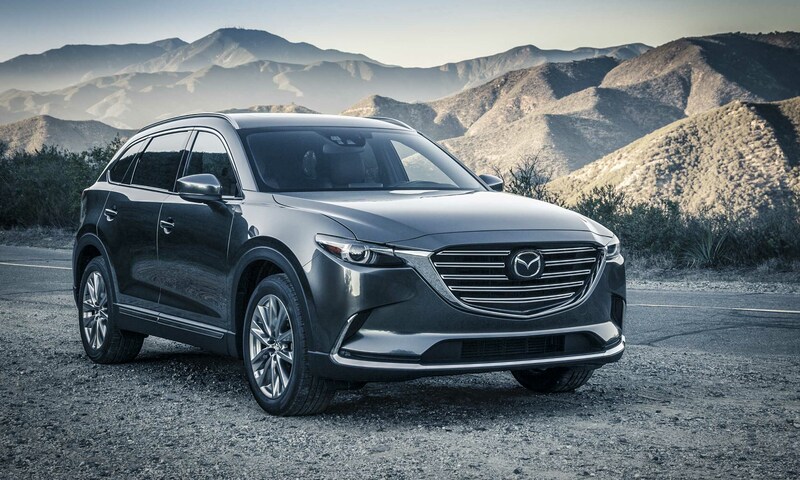 Other features of the Advanced include a color head-up display, rainsense wipers, programmable and remote controlled air-conditioning, parking assist with sonar, a blind-spot monitor and rear cross-traffic alert. Also standard on the Prius Prime Advanced is a high-end JBL audio system with 10 speakers as well as Prime Apps, featuring Remote Charge Management, a Charging Station Map, ECO Dashboard, Remote Climate Control and a Vehicle Finder. 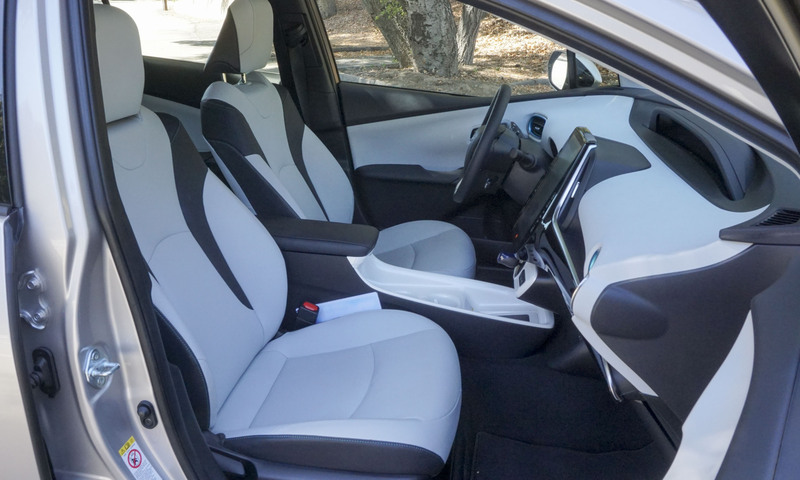 The standard Prius was all-new last year, so the updates to that model carry through to the new Prius Prime, meaning you get a roomy cabin with a clean design and comfortable seating front and rear. A large center console contains plenty of storage, and the dash-mounted shift lever frees up extra console space for cupholders as well as a wireless charging cradle for a cell phone. A standout feature of the Prius Prime (on higher-level trims) is the big high-res display screen in the center of the dashboard. Unlike many screens that seem like an afterthought, this one is nicely integrated into the dash. 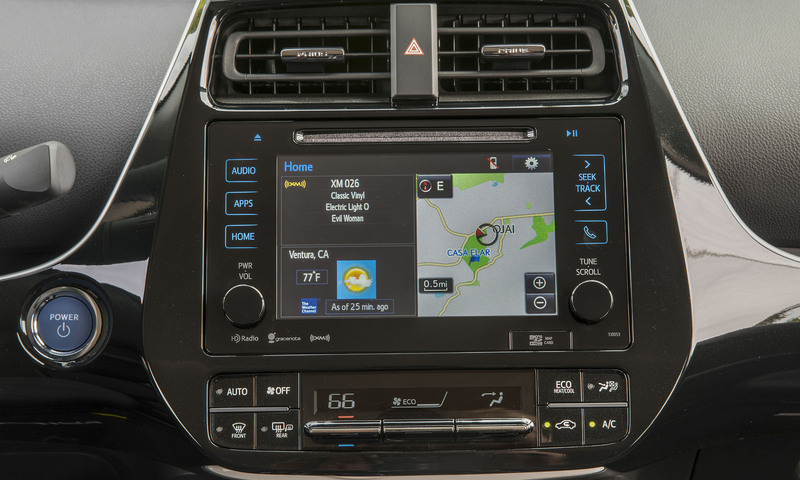 With so much real estate, the navigation screen can always be on display while other functions such as phone, climate control and entertainment also remain visible. The entry-level Prius Plus features the older, smaller screen — which remains very functional. Although we like the larger display, we still prefer actual knobs for changing volume and radio stations — these are lost with the larger screen. 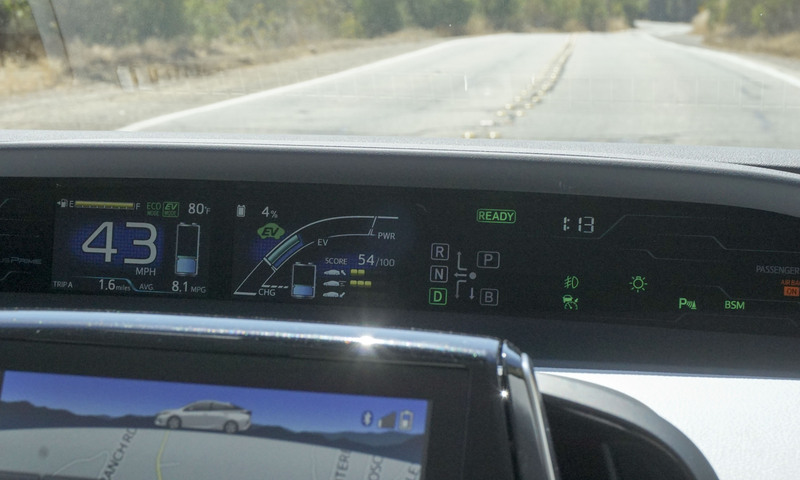 The upper screen gets packed with data showing speed, fuel economy, battery status and a driving score, which shows how efficiently the Prius has been operating. A lot of data appears in the display simultaneously, which can make it a little difficult to interpret. 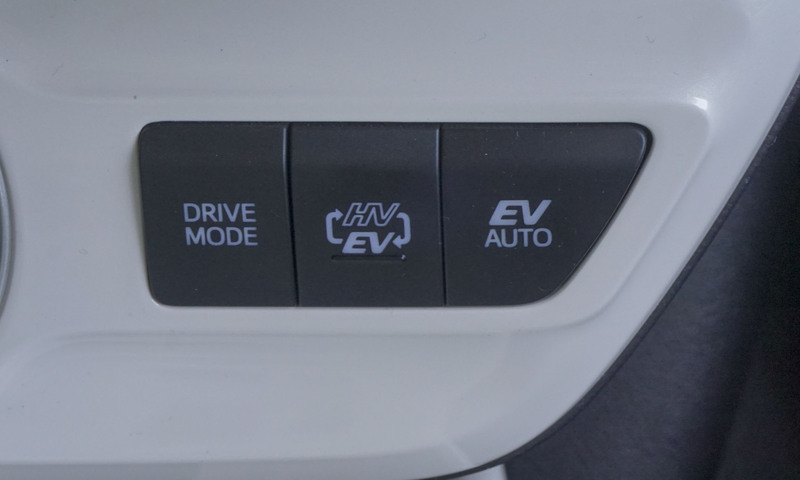 We were surprised that EV range is not part of all that data; however, this information is in the head-up display. 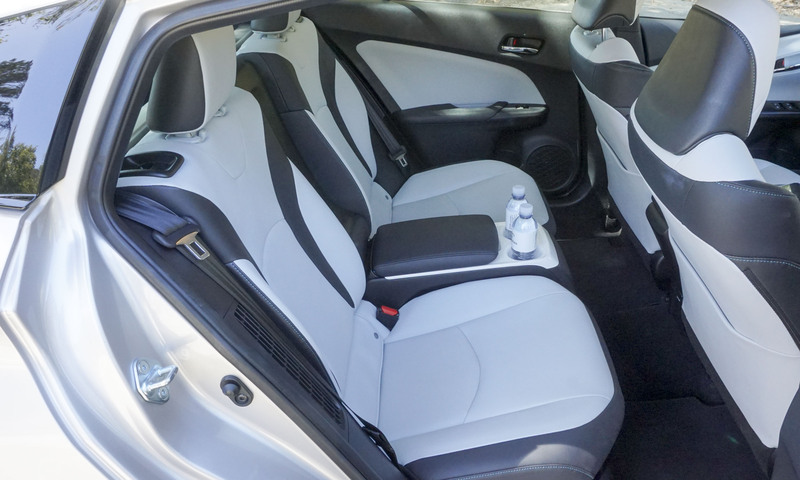 The Prius Prime is a true 4-seater, so the rear cabin is actually quite roomy. We noticed plenty of legroom, even with the front seats occupied; however, some tall passengers might find the headroom a little tight. Rear-seat occupants have cupholders as well as a covered center bin for additional storage. Rear seats can be folded flat, but with the additional batteries in the cargo area the cargo floor has been raised. 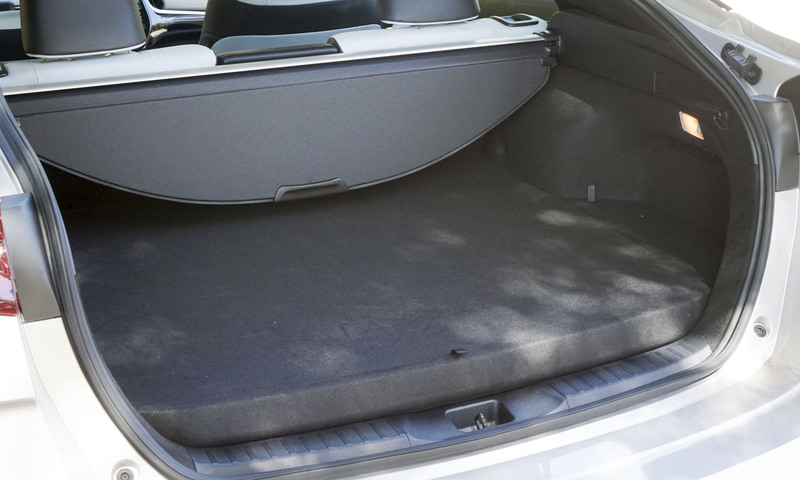 This means you no longer have a flat load floor when the rear seats get folded. That said, the cargo area is quite spacious, even if it is slightly smaller than the space in the standard Prius. The Prius Prime uses the same basic powertrain as the standard Prius — except for a larger battery pack in the Prime. 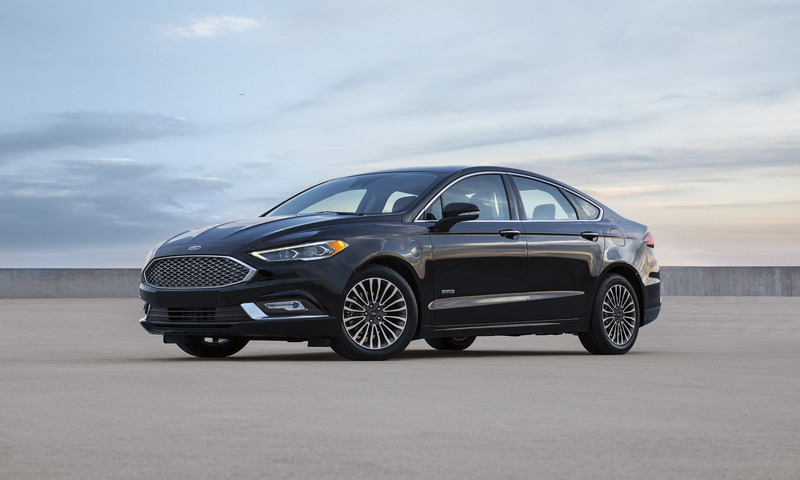 The hybrid system consists of a 1.8-liter 4-cylinder gas engine producing 95 horsepower and 105 lb-ft of torque teamed with two electric motors. One of the motors drives the front wheels while the other functions as a generator. 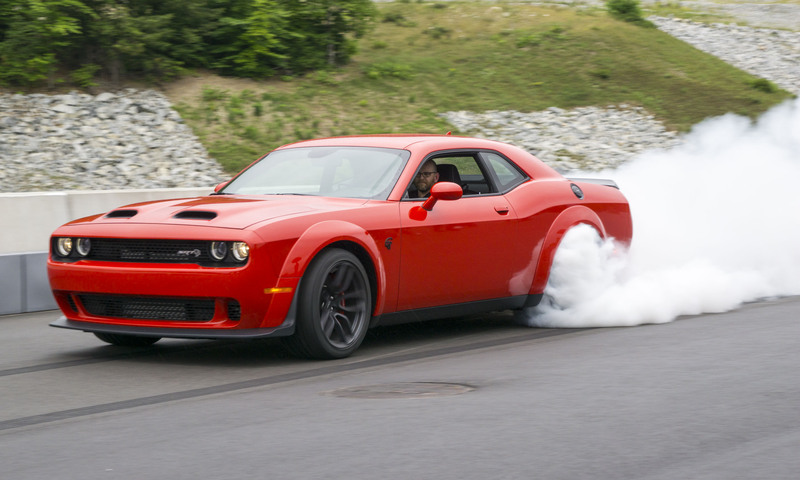 Total power output is 121 horsepower — the same as the standard Prius. With the additional battery power, the Prius Prime can travel up to 25 miles or reach speeds as high as 84 mph in electric-only mode. In our informal test, we found the range estimate quite accurate, even under a variety of driving styles and terrain. 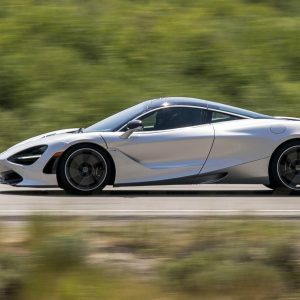 Once the battery pack’s charge has depleted, the Prime switches to a typical hybrid mode in which the electric motor provides additional power while the gasoline engine gets used as little as possible. 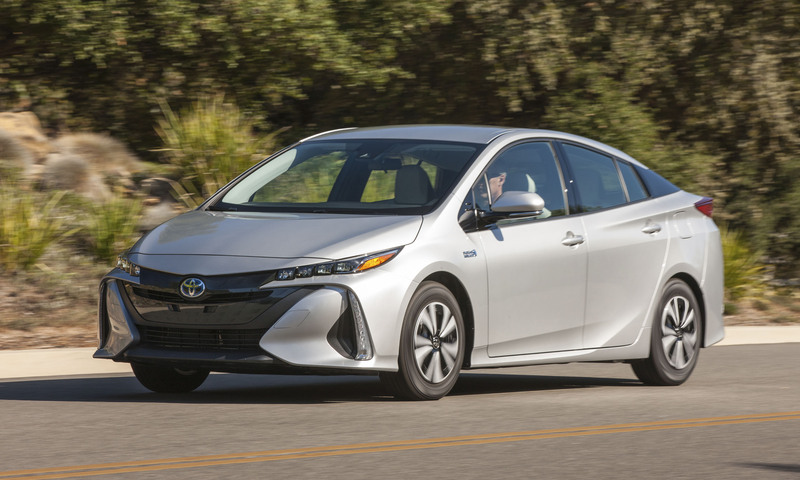 The EPA hasn’t released fuel economy numbers for the Prius Prime, but Toyota estimates that it should be rated at 55 city / 53 hwy / 54 combined. When traveling in EV mode, the Prius Prime is expected to achieve an impressive 133 MPGe. Expected driving range would be around 640 miles. 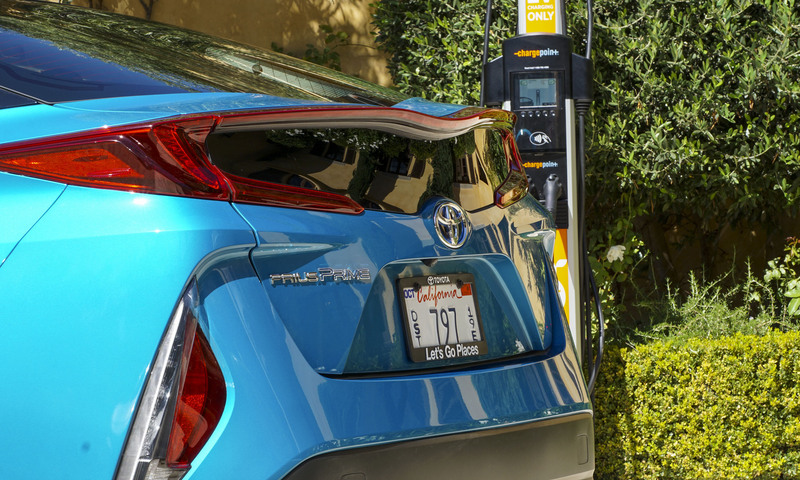 Prius Prime can be easily charged overnight using a standard 110-volt outlet. 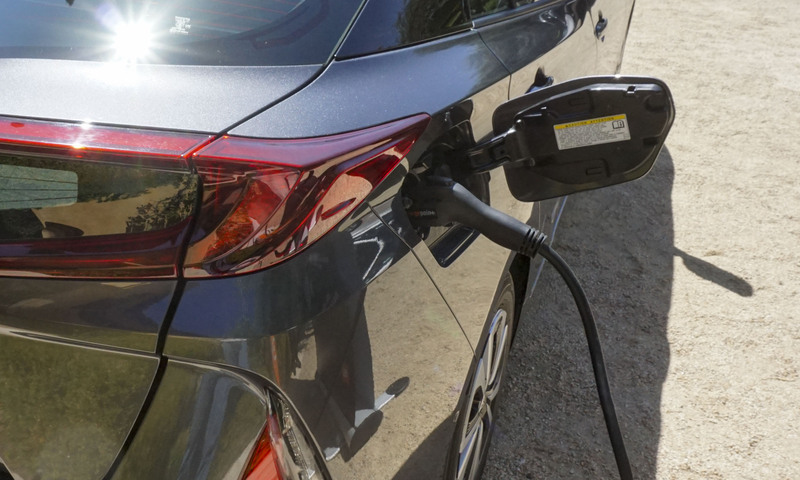 Toyota claims it should take about 5.5 hours to reach full charge — the time drops to just over two hours with a 220-volt outlet. The charge time can also be scheduled to take advantage of lower power rates that often occur late at night. 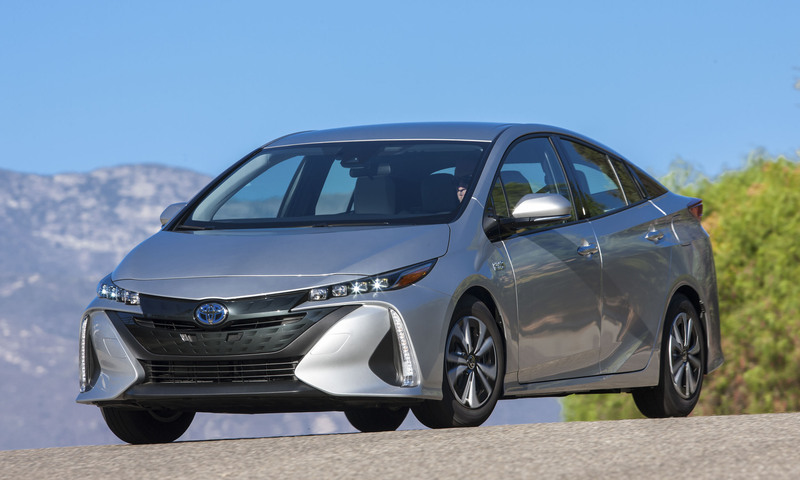 When Toyota redesigned the Prius last year we noted huge improvements in performance and handling. We’re happy to say these improvements are still evident in the new Prius Prime. We had the opportunity to use the full 25 miles of EV-only range and found power and acceleration to be on par with other electric cars. 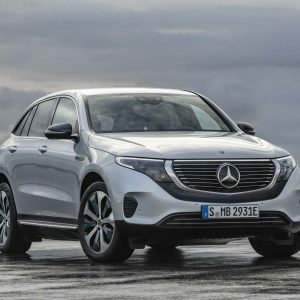 Acceleration is not incredibly strong with only the electric motor providing power, although merging onto a freeway should not present any real issues during everyday driving. 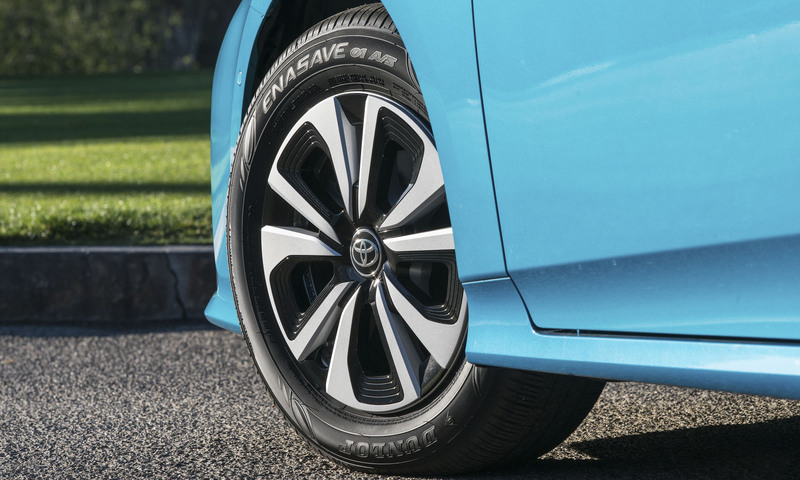 While some regenerative brake setups can feel “grabby,” this is not the case with Prius Prime; the new hybrid’s brakes are smooth and easy to modulate. For steep downhill descents, we selected “B” on the transmission, which slows the car while increasing regeneration of battery power. After depleting the power in electric-only mode, we were able to recharge during a steep downhill and add an addition seven miles of EV range. Once the EV-only cycle has been consumed, the gasoline engine starts automatically to work with the electric motor in typical hybrid fashion. 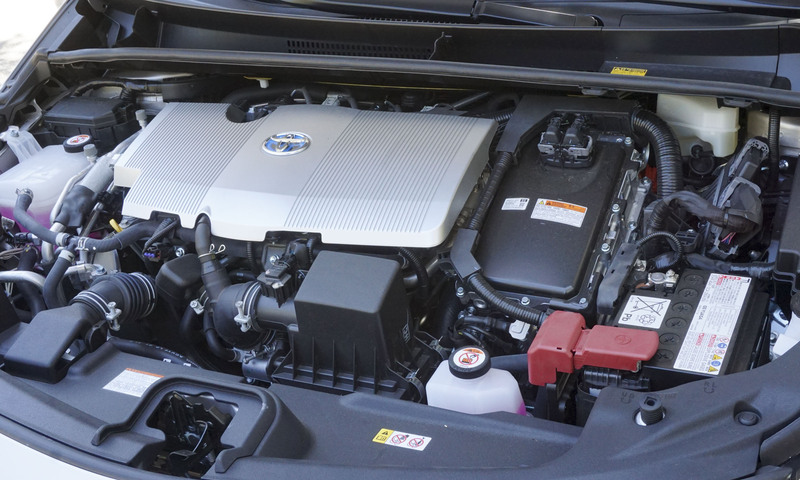 Although drivers will experience a noticeable increase in power when the gas engine comes to life, they will also notice the transition from silent running to a somewhat buzzier driving experience. 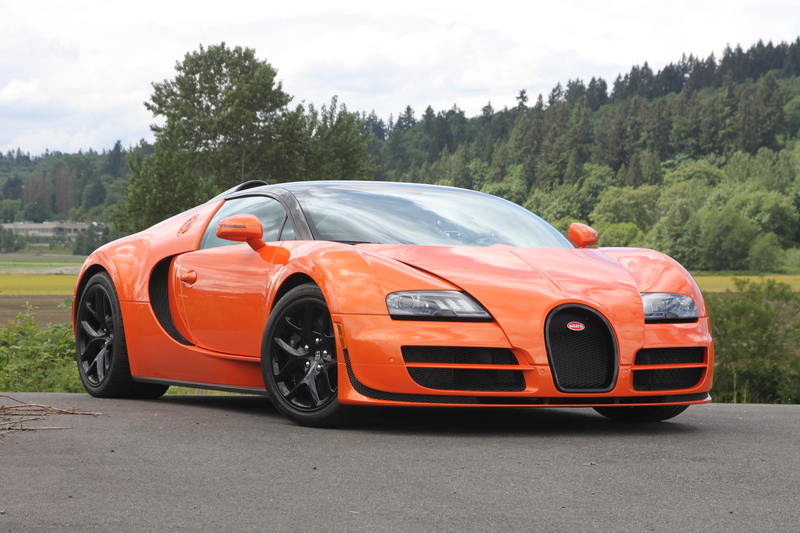 The engine revs will vary with the continuously variable transmission, and under high load the sound can be intrusive. 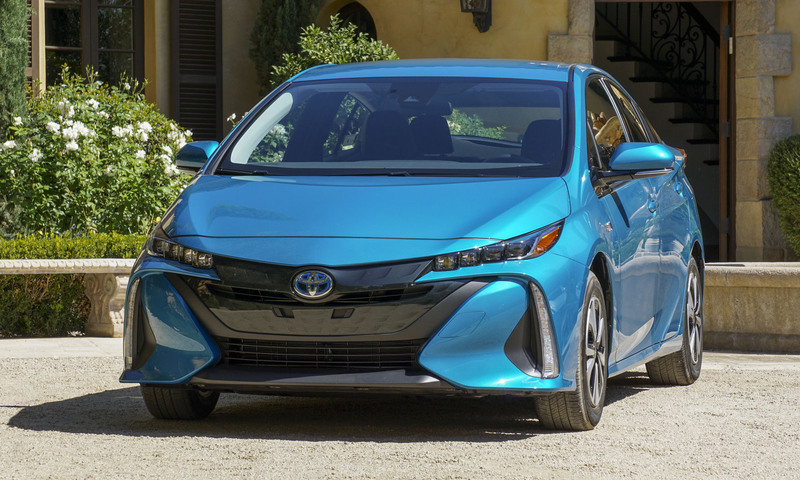 The Prius Prime is a few inches longer and weighs about 300 pounds more than the standard Prius, and with only 121 horsepower the extra heft is noticeable during acceleration and cornering, but overall the Prime still handles well. We performed an unscientific acceleration test (using a stopwatch) and reached 60 mph in a bit more than 11 seconds, which is the time that Toyota estimates in press materials. For those looking for excellent fuel economy, the standard Prius already offers some impressive EPA ratings. 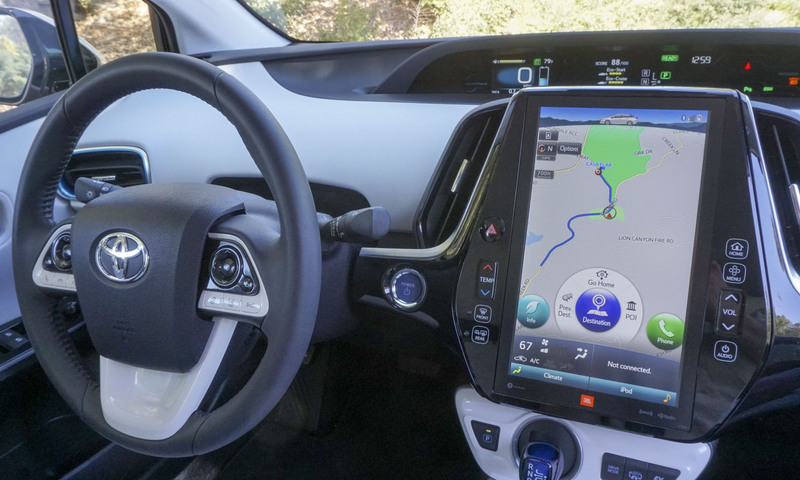 But for the driver who has a short commute and can take full advantage of the 25-mile electric range, the Prius Prime becomes quite enticing. The large display screen and other high-tech features will surely attract early adopters of new technology. Ultimately, the Prius Prime makes most sense when drivers plug it in and make use of that gas-pump-passing electric-only range — otherwise it might be tough justifying the additional $3,000 over the standard Prius. 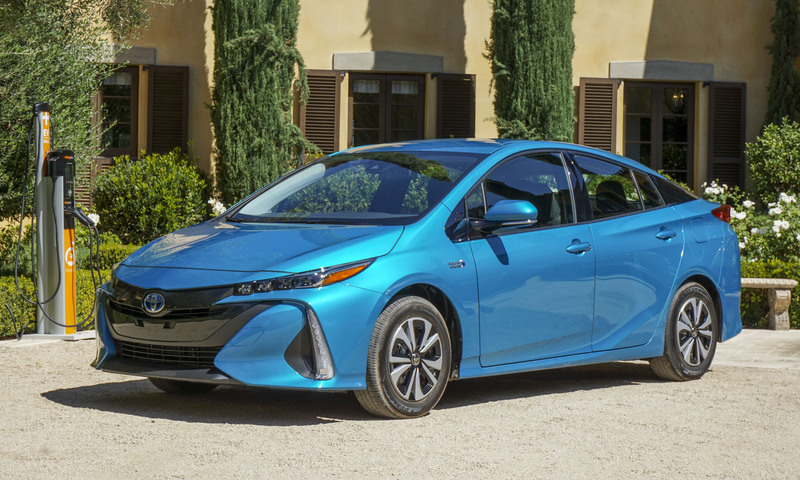 Bottom Line: With the Prius Prime, Toyota offers its best hybrid thus far. Pros: Great fuel economy; high-tech interior, usable electric range. Cons: Buzzy gas engine; display can be distracting; seating for only four.